By far the largest and most well-known website hosting service in the world, GoDaddy has been around since 1997. In less than ten years, they were hosting over ten million websites, largely due to their first Super Bowl ad. Since then, their sometimes-funny, sometimes-controversial Super Bowl marketing has kept the hosting service growing at exponential rates. These days, they host over 60 million domains, and their development as a company is clearly still moving. In 2015, they released GoDaddy Pro, the Web Pro brand for developers and designers. One of the key features that has made GoDaddy so popular is their excellent customer service. This is such a rarity in Internet hosting services that GoDaddy has managed to hang on to more than 13 million paying customers throughout the years. They are well established as a reliable brand that will give you the help you need to build and host an excellent website. Their website builder is on par with many of the most popular website creation sites, such as WordPress. The user interface is easy to use, and includes hundreds of templates to make it easy for all users to build a great site, even if you aren’t a designer. Everything is drag-and-drop, so it’s simple to move elements around till you create a site you want. Once you pick a theme, you won’t be able to change it without losing all your content. You’ll have to redo your entire site if you want a new look. They also create backup copies of your website any time you want. No other website hosting service does this for free. If you want to try a new look, or create a new page, but you’re worried that you may make a fatal mistake, you can get a quick backup of your site saved before you try out your new ideas. One major drawback is that GoDaddy’s website builder doesn’t offer any sort of e-commerce integration. If you want to sell items through your website, you’ll have to build your site elsewhere, and then integrate GoDaddy as your host instead. Also, GoDaddy’s mobile display is limited. As a host, however, there is nothing that can be nitpicked. GoDaddy’s servers are solid, with dependable uptime and great hosting packages. The monthly cost for shared hosting is slightly more expensive than many competitors, but with the dependability of the service, many users are glad to pay the extra cost. GoDaddy’s shared hosting services can’t be rivaled, especially with their excellent customer service. They work for any website of any size, and can be integrated with nearly every website builder you can name. GoDaddy’s shared hosting services can’t be rivaled. They work for any website of any size, and can be integrated with nearly every website builder you can name. If you just want a professional domain, and you want to ensure that your site is always up and working perfectly, you can’t go wrong with GoDaddy. 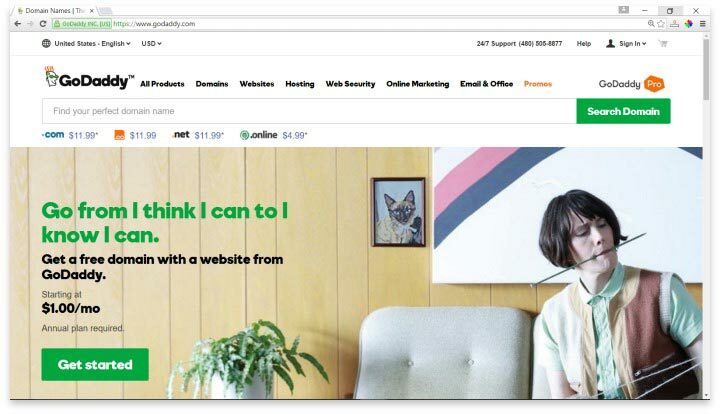 If you are a small business owner, or a professional who needs a basic landing page that looks both creative and designer-quality, GoDaddy’s website creation services are excellent. Their customer support team is a huge bonus that makes them very attractive to users who aren’t technically savvy, or who just need a little help ensuring that everything works as it should. If your customers usually visit through mobile devices, you may be better off building your site elsewhere, and hosting through GoDaddy. Have you had an experience with this company? Please share your GoDaddy reviews below.